Some of the tennis stars were at Breezes in Crown Entertainment Complex for the annual Crown IMG Baller Party celebrating the start of this year's Aussie Open. with sisters Melinda and Victoria Petrolo. Jelena Jankovic is wearing a Wayne Cooper dress and Louis Vuitton bag and shoes. Roger Federer is Mr Suave no. 1. 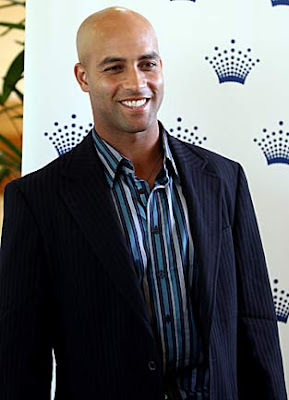 James Blake is Mr Suave no. 2. 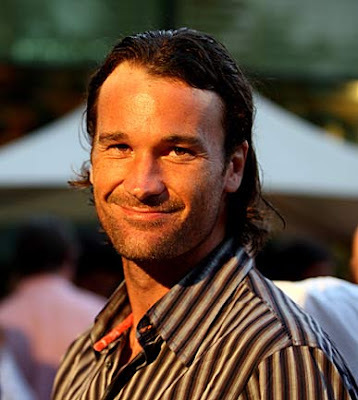 Carlos Moya is Mr Suave no. 3. Feliciano Lopez spoilt the party with a cheap homemade t-shirt. David Nalbandian shares a laugh with Channel Seven's Mia Grieves. Radek Stepanek looks as if he owns Nicole Vaidisova. Well, literally he is. And his girl looks kinda intimidated. Australian wild card Monika Wegnert, 16.